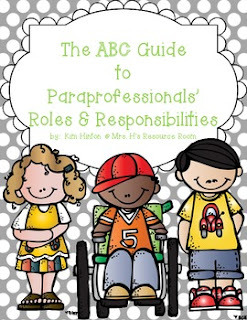 Tips for Working with Paraprofessionals - All Things Special Ed. 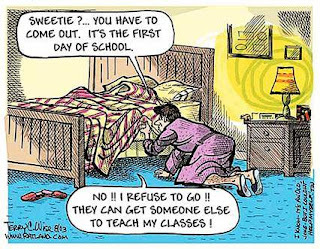 Hello and welcome #weteachsped people! I am Lisa from All Things Special Ed. 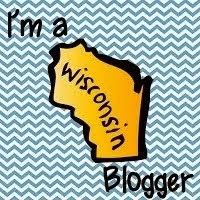 in case this is your first time stopping by my blog! Today I am going to be talking about tips when working with Paraprofessionals. I can tell you the hardest part about being a special education teacher is working and training paraprofessionals, that is the one thing they do not teach you in college! Here I made a list of tips and tricks to use/try before the school year starts. 1. Treat your para's as professionals and with respect. I like to start the year off on a positive note so I make each of them a little BTS gift or bring in a basket of goodies on the first day for them. Check out Pintrest- there are tons of ideas to "steal"!! 2. Invite your para's in before the first day of school. Have your para's come in and go over procedures, expectations and schedules. This helps make the first day/week of school go by smoother. 3. To help make your expectations and responsibilities clear, have it down in writing! Check out this awesome recourse from MRs. H's Resource Room on TPT!! I am using this with my para's to start the year off right with clear exceptions! Things that are outlined in the booklet include: arrival, behavior, circle/center time, dismissal, equipment, folders, go to binder, home/school contact, confidentiality, chain of command, know the leader, language, lunch, monitoring, need to meet, open door policy, participation, quiet, recess, restroom, schedules, table time/independent work, and more!! And I couldn't have said any of it better! This is great resource so thank you Mrs. H.!! 4. Lastly, tell them thank you for all they do- sometimes a nice hand written letter every so often is a great reminder for all they do. We can't do our job successfully without them! They are our eyes and ears in the classroom and having them there helps us to do what we need to do to be successful.